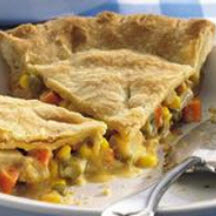 CooksRecipes has quality, kitchen-tested recipes for chicken pot pies that you can count on for successful deliciousness. Say hello to an updated culinary classic! 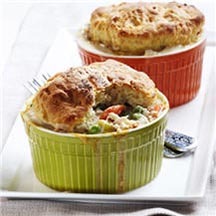 A buttermilk biscuit crust, shredded rotisserie chicken and a savory vegetable filling make for a heart-warming supper. A buttery, lemon-ginger pastry crust covers a filling with tender pieces of chicken, pearl onions, carrots, chunks of Granny Smith apple and dried cranberries. 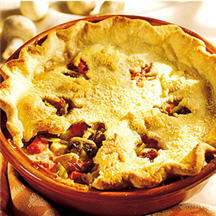 Leeks, dried tomatoes and a golden Parmesan crust update the traditional chicken pot pie with great tasting results.